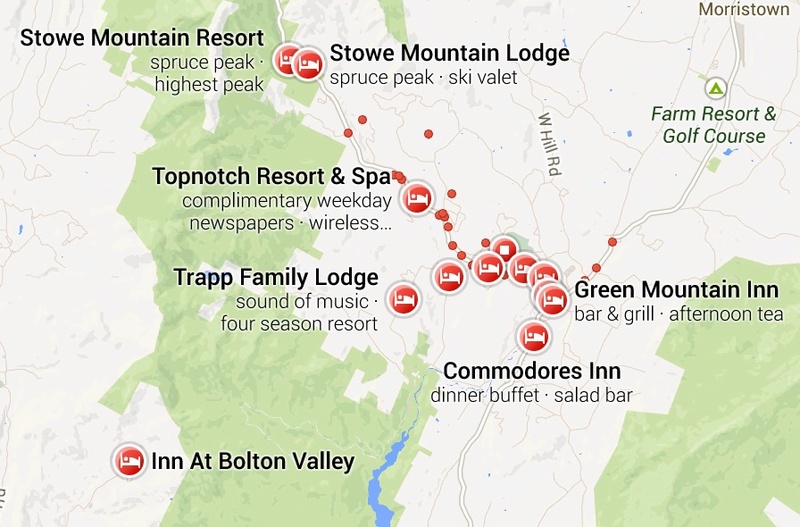 Search engine experts both within the lodging industry and outside it have already written on the previews of the new Google Maps, announced in May. Most have described the ways the appearance will change, some expressing concern, others joy. 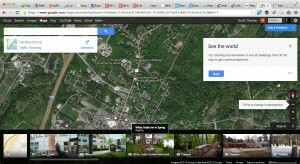 Few have taken a hard look at what the new Google Maps will mean about your Google+ Local Listing. If you’re not actively using Google+ Local, you will have to change that, for your business to survive. For the past several years those who deal with online marketing in our industry have stressed the importance of claiming your Google+ Local listing (or its predecessors), completing all the information, uploading photos and videos, etc. With the change to Google+ Pages for the listing, you can add posting regularly to the Page as another requirement. Despite this encouragement, many have failed to claim their listing, or have not updated it regularly. All that must change, if you want your business to survive – let alone prosper. Do you think I’m exaggerating? Take a look at your Google+ business page. You do have a Google+ business page, don’t you? Hover your mouse over the top left where it says “Home”, and select Dashboard from the pop-out menu. There is only one area of primary interest, for our purposes. Look at the chart called Insights. Near the bottom of that chart, click “View Insights”. The boxes at the top tell the tale. The first box tells how many followers you have – need to work on that later. The second box, with the big number (we hope) tells how many people saw your Google+ page because it came up in their search results, even if you’re not doing anything with it. Nice. Now the cold water to the face: the third box, with the much, much smaller number, is the number of people who did something other than leave your Google+ page – clicked through to your website, clicked for driving directions, shared the page, etc. Figure out the percentage of “actions” to “Views” by dividing the little Actions number by the big “Views” number. Oh. Right. Think of all the rest of those folks as lost opportunities. It’s about to get worse with new Google Maps. 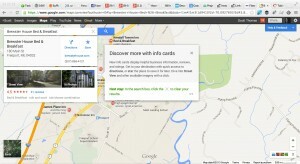 You see, the new Google Maps rewards those who use Google+ Local well. There is no more list of top results, A-G (sometimes referred to as the “7 pack”). Well, actually there is, but few will see it, because you have to actually find it and click through to it. It won’t appear by default. If you were the guest performing the search, which would you click on? The tiny dots or the larger ones? So what shows up? Good question! If you search something like “lodging in YOUR TOWN”, the map centers on the town you have searched, with a bunch of red indicators. Here’s the first way you get rewarded. 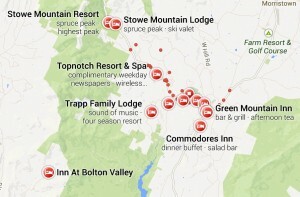 There are slightly larger red circle icons for those who are active on Google+ and have Google reviews. That’s right – you’ll need to get Google reviews. There are also tiny red dots – for those who don’t play in the Google+ Local sandbox. When you click on one of the icons, the result is displayed at upper left in an Info Box. What appears? It depends – if your Google+ Local page is up-to-date, it shows the photos you put there. If not, it is only text. If you were searching, would you click on one with photos, or only text? At the lower right of the map there is a tiny row of colorful icons. Clicking it brings up a carousel of photos along the bottom, of places that are on the map. If you click one of the images, an arrow appears from the photo to its location on the map. This carousel appears by default in Google Earth view. It appears that the carousel of photos comes from Google’s Image search, rather than from the Google+ Local pages. If these are taken from the Google+ Local pages, it serves to underscore the need for owners to post as many great images as they can. If they come from Google’s own Image Search, you can still have an impact by getting more photos of your business online – on your website, your Google+ Local page, and on your blog. You can see more about this carousel of photos here and here. What’s an Innkeeper to do? It may seem obvious, but there are things you can must do. Do them now, before the new Google Maps rolls out (the date hasn’t been announced, but the product has, so don’t waste time – do it now!) and changes the face of local listings. If you haven’t claimed your Google+ Local listing, do it now! Be sure you’re logged in to a Google account (or create one free). Search for your property on Google Maps, click on “More info” to find your Google+ Local page. Scroll down and find the “Manage this Page” link inside the “Is this your business?” box and claim the page. Complete all (100%!!!) of the information requested. Post as many photos (make them good!) of your property as the page allows. Post as many videos as the page allows – if you don’t have videos of your own, find videos of your area posted by state, local, or regional tourism offices. Preview the videos to be sure they are relevant and of good quality, and link to them. Post regularly on your Google+ business page. Post blog posts, events, whatever. Get lots (and lots!) of Google Reviews of your business. You can see a preview of the new Google Maps here, and request early access to the new Google Maps here. Thanks for this informative post, Scott. I just updated my page. Question—somehow there are TWO pages for my inn, one of which I have populated with info and photos and the other that’s pretty blank except for address/phone, etc. Do you know how to get rid of the 2nd one? It is hard to be sure, but I wonder if you may have created the Page that is filled out as one of the original business pages (also referred to as a social Page), and perhaps the other was created by Google as a Local page? At various times there has been a way to merge these (or to get one deleted). I do notice that both show up as “Local” at the top left (where the “Home” link usually can be found). I searched on “merge Google Plus local business page” and found several articles. Unfortunately, G+ has changed the appearance of the pages since most of these were written, so some of the places they tell you to click or look have changed. One of the best is Mike Blumenthal’s article on merging your listings here. It may also be possible to get some help direct from the Googleplex – see this article. EDIT: I’ve learned from a friend in the industry that they’ve found that logging into your Google+ Dashboard seems to offer the opportunity to consolidate the two pages. I haven’t tried it myself, but it sounds like a good prospect.